John Carmack says he'd hoped for a development deal between ZeniMax Media and Oculus VR but when it didn't work out, he decided to leave. It was big news when John Carmack left Id Software in November of last year, three months after he joined Oculus VR as chief technical officer. The reasons for his departure were never given, although his recent offer to give his traditional talk at QuakeCon if organizers will allow it suggested that it may not have been entirely amicable, but in a new interview with USA Today he said it was simply a matter of wanting to pursue interests that ZeniMax Media, which acquired Id Software in 2009, wasn't interested in. "It would have been a huge win," Carmack said of his plan to bring Wolfenstein: The New Order, Doom 4 and other Id titles to the Oculus Rift headset. "It seemed like a sensible plan for me." Carmack said he probably "would have been content" staying at Id and carrying on with the work it was doing if ZeniMax and Oculus had been able to strike a deal. "But they couldn't come together on that which made me really sad. It was just unfortunate," he said. "When it became clear that I wasn't going to have the opportunity to do any work on VR while at Id software, I decided to not renew my contract." 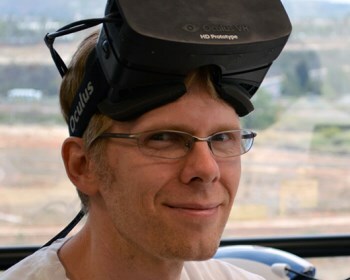 Despite his sadness at leaving, Carmack made it clear that he has no regrets, saying that he thinks "VR is now one of the most exciting things that can be done" in the industry today. "I've seen this when we transitioned from 2D games to 3D games and everybody has seen the mobile transition, right now in the last five years," he said. "After you have been around for a while, you can notice some of the trends. It really feels like VR has the possibility to be something really huge." Late last year, Oculus VR CEO Brendan Iribe said Carmack was "spearheading" mobile development at the company and suggested that his work there would have an impact comparable to that of Doom in 1993.